Having my own space for the first Halloween/fall season has already been so much fun! I absolutely love autumn, it’s such a beautiful time of year, especially in upstate NY! 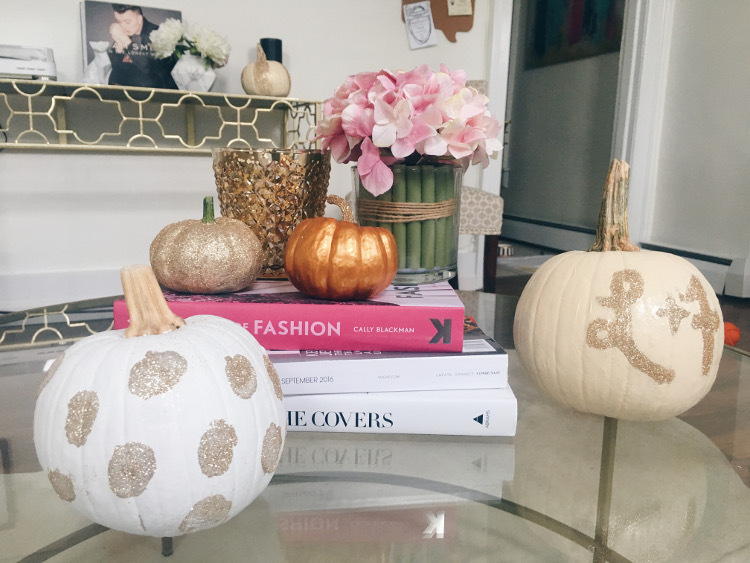 I decided to give my apartment a touch of fall decor by decorating some pumpkins, but I'll be honest, I'm not a pumpkin carver by any means. I turned to Pinterest for some alternate ideas and found some amazing options. I picked my color scheme (white and gold obviously haha) and got to work! Tip: DIY projects are more fun with friends! I had my friend Myriah help me with this one. :) I provided alcohol. 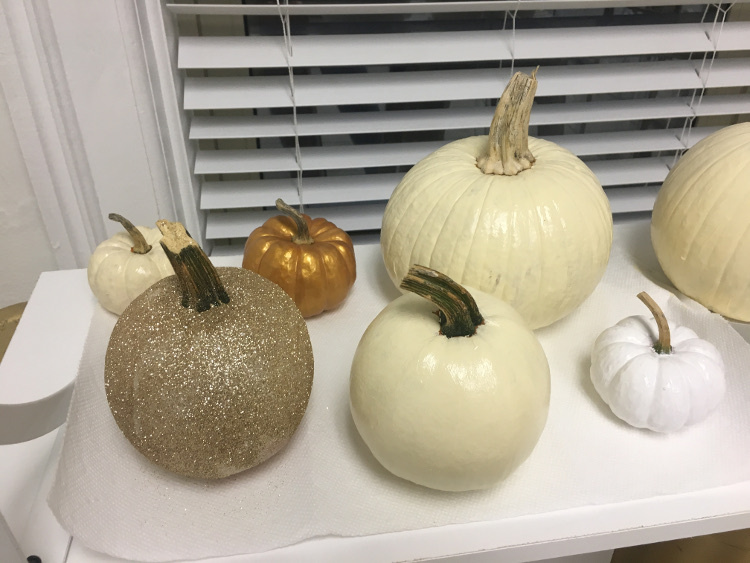 I found a few Pinterest pumpkins that I liked, but most of them called for plastic pumpkins, which will definitely last longer than the real thing. I opted to go for the real deal and buy pumpkins. Pumpkin and apple picking season is a great time to support local businesses/farms! I picked my pumpkins up locally in Oxford, NY - but to be totally honest I forgot the name of the place haha! Whoops! Supplies Once I chose my color scheme, I headed to the arts & crafts section to pick up my supplies. I chose white, ivory and a metallic gold. I did buy black but didn't end up using it. 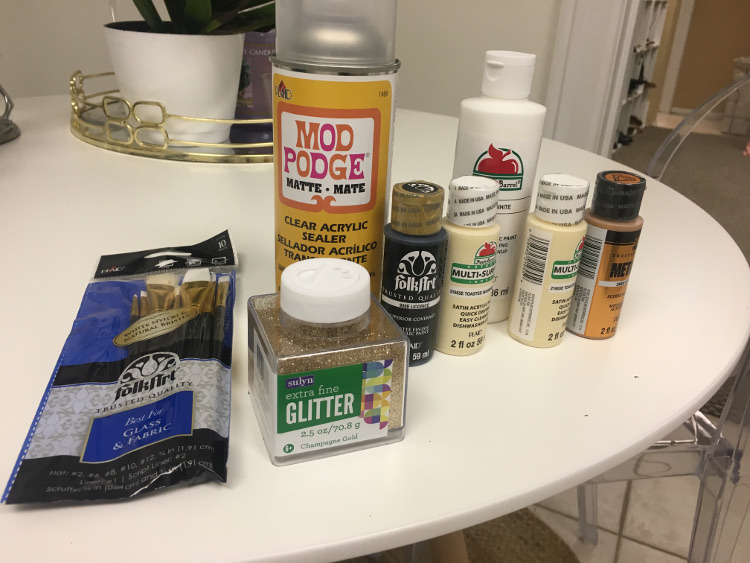 Although I didn't get a photo of it, I used the Mod Podge spray at the end on any pumpkins that had glitter on it. 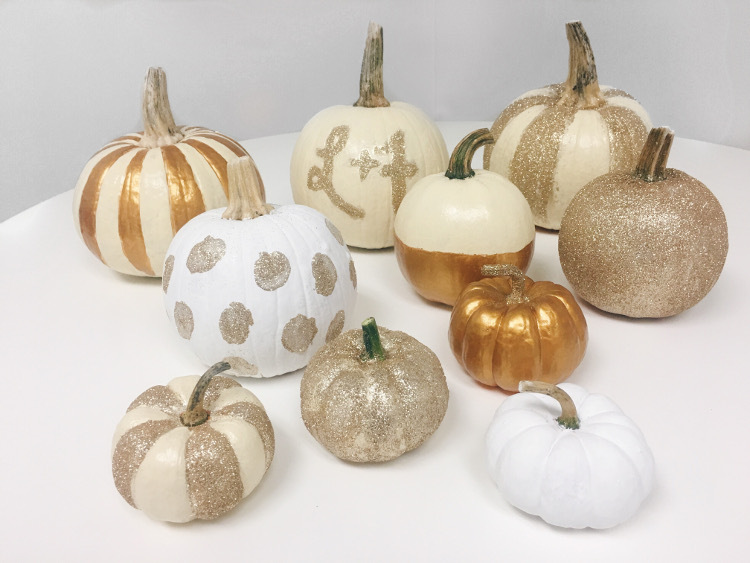 This helps to keep the glitter from falling off the pumpkins. But let's be honest, I have glitter EVERYWHERE after this project. The pumpkin stand I visited had an honor system for payment, I only had a $20 so I picked up enough pumpkins to use the amount of money I had since I couldn't get change. The materials cost me $21 - all in all this project was affordable and fun! In progress We decided what we wanted to do to each pumpkin before we got started. 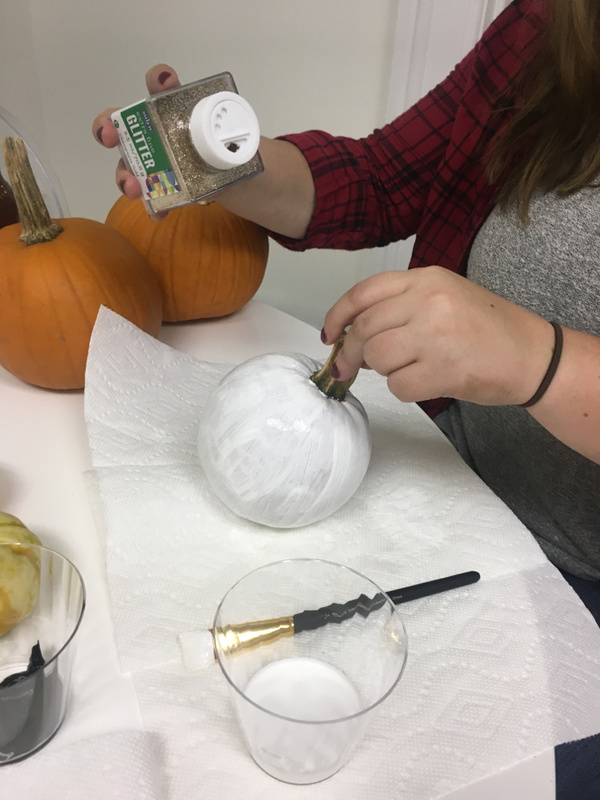 For pumpkins that involved glitter, we painted two full coats on the pumpkin first and letting them completely dry. In order to make this a one night project, we did blow dry the pumpkins to help them dry faster. To add glitter, we used paint as glue and applied a third coat to the spots where we wanted the glitter to stick to. Having a space for the pumpkins to dry is crucial! The final result As I mentioned earlier, I didn't get a picture of spraying the Mod Podge, but it definitely helped. It just applies a clear sealant over the glitter and helped to make the surface a bit smoother. This DIY project was so much fun and so easy to do. I really love the way everything turned out. All in all, the project took about 3 hours to complete and wasn't too expensive either! I love having the decor in my apartment!